Bexley presents a beautiful picture of femininity and she knows it. Short and more stocky than fragile, her huge blue eyes, thick reddish lashes and delicate facial structure immediately make her look innocent and attractive, but the smile on her face is more often mischievous than it is genuinely pleased. 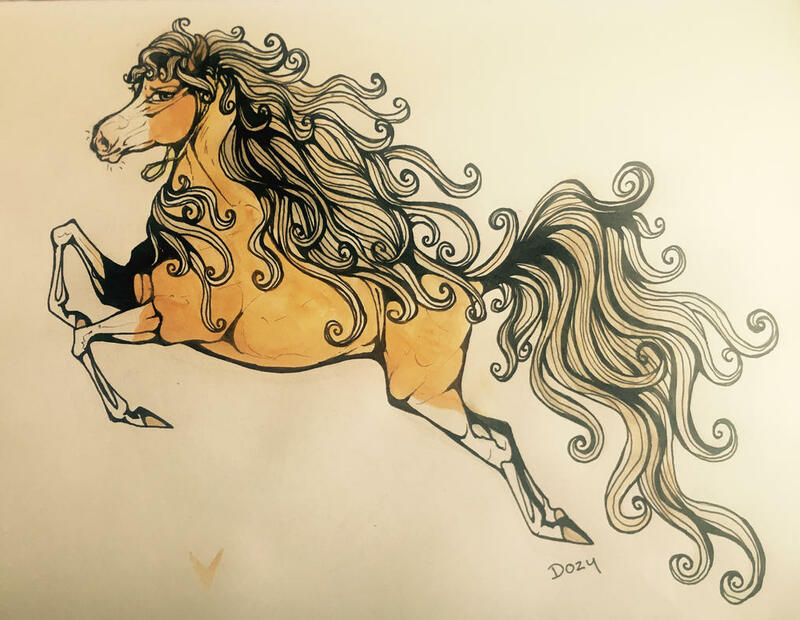 Fat golden-white curls make up her mane and tail, and are so thick that Bexley’s body sometimes seems overwhelmed by the amount of hair. Her skin is a very yellowish chestnut that looks entirely golden in direct sunlight, and minimal sabino markings have given her uneven white stockings that reach at least past the knee on every leg, as well as a white facial marking that covers the bridge of her nose and coats the underside of her face up to the throat while leaving her cheeks and forehead chestnut. A tiny gold chain hangs around her neck, one that she’s been wearing for the vast majority of her life - as she’s grown into it it’s become snug around the base of her jaw, but Bexley refuses to take it off, as it was given to her by her parents and remains her only reminder of the home she left behind. Her brother has a matching one, and so the necklace, while not a full show of Bexley’s childhood wealth, is extremely important to her. When she speaks her voice is always deeper than one would expect it to be, feminine but very low pitched and smoky; she laughs loudly and smirks more than she smiles. The scent of Solterra, and of rosewater and incense smoke, always follow her. A large, raw scar splits her face into two equal sectors, trailing from just under her left eye to the corner of her mouth. It is often the first thing people notice when they look at her; the tale of the wound is a touchy subject. Catty, loudmouthed and extroverted, Bexley operates on her own wavelength, which is that of a girl who has an excess of confidence and a lack of common sense. Dangerous situations, risk-taking and petty revenge are her specialty, though you’d never guess it by looking. Purposeful plays off her very feminine appearance, complete with eyelash batting and girlish giggles, lead people to think that she’s a beautiful but dumb blonde. She loves the attention she gets for looks, and, while she prefers to run her schemes and the rest of her life very independently, she’ll never turn down an opportunity to be worshipped and put in the spotlight. This, combined with Bexley’s penchant for all things shiny and beautiful and the materialism ingrained in her since birth, makes up the classic Barbie side of her personality; but while she does love to play ditsy and cute, her real brain is overtly ambitious and conniving, and she’ll steamroll almost anyone to get what she wants. She’s turned a 180 since her days as a calm, quiet child and grew instead into an absolutely mercurial being, a hedonist at heart who obeys whatever ideas float through her head and remains focused on herself and herself only. Though she doesn’t do it often, she does know how to hold her tongue and always seeks to learn about others before she reveals anything about herself. Attentive and quick on the uptake, Bexley considers herself a problem solver and is not easily spooked by challenges; she trusts her gut and will happily take on basket cases or help other people with their deep-rooted issues if she thinks it’ll help her in the long run. A social butterfly who doesn’t trust easily, she has an extremely limited inner circle but loves drama, which means she has no problem bouncing from group to group in order to find out what she wants to. An absolute refusal to lose her games and a lack of genuine sympathy makes Bexley - though she’s often underestimated - an unexpected but dangerous enemy, as well as a valuable addition to any circles she finds worthy of her time. A golden child since the moment she was born, Bexley’s childhood was entirely sunshine and riches, filled with the constant, doting over-affection and under-discipline of her parents, the immediate respect and worship of those that lived in her homeland, and, best of all, the built-in partner in crime of her brother, Laszlo. Being younger and a girl, Bexley was coddled intensely. Provided with jewels, attention, and whatever else her heart desired, the time she spent at home was blissful. As the only princess of a family who was well respected and brimming with royal blood, Bexley’s naturally sweet personality was instantly spoiled. The only princess of a well-respected family absolutely brimming with royal blood, it was hard not to get sucked into the rich-kid black hole, and Bexley let herself fall into a lazy, hedonistic lifestyle. But the highlight of her days always remained her brothers. Laszlo and she would go off on day adventures through the mountains, wreak havoc on the other kids, avoid the lessons that would eventually be pushed on them as they learned to become royalty. At a little past two years old, her world started to dissolved. It took quite a while for her to notice, as at that point she was still extremely sheltered and stubborn enough to see only what she wanted to. But eventually, the unrest of the common kingdom - one she had considered entirely separate from her perfect family - began to bleed into her life. Her parents held hushed arguments; jewels went missing from their stash; Laszlo was taken from her more and more, in order to attend emergency meetings and attempt to grasp his place in politics. Alone for the first time, Bexley’s hedonism ran as rampant as ever, but with no one to go to she became secluded and bitter, finding the sharp, angry side of her personality that had been missing previously. And then the climax: people were angry. Bexley had no idea, had only just learned what it felt like for her, couldn’t possible imagine the rage of the common people and the vendetta they held against her family. The Briars were perfect in Bexley’s head, but the citizens they lorded over suffered for their greed and pride, lacking in resource and community due to Bexley’s father’s inane control over them. Hundreds of years of Briar tyranny had leached their homeland dry. Families had been split, commoners imprisoned for simply disagreeing with the king, slaves taken and heirlooms stolen, and people were tired of it. With the leaders of the revolution knowing there was only one way to end the Briar lineage, Laszlo was executed. Bexley took a look at the body of her beloved brother and knew instantly that there was nothing left for her. Her parents would be dethroned and her riches taken, her status stripped, her pride run over. She had one chance to leave - start over, and be worshipped properly. Despite everything, her confidence had not wavered and she still felt the presence of her royal blood. It needed to be recognized, but it surely wouldn’t by these people. Stealing away in the middle of the night without a word to her parents, Bexley steeled her resolve and found her way to lands unknown, Novus, where she has begun to plan and plot her return to glory. Bexley can only manipulate sunlight; torchlight, moonlight, etc. do not respond to her powers, and using her magic is easiest in the middle of the day when the sun is highest. With some effort and concentration, she is able to both absorb and deflect light, though when deflected the sunlight is still shapeless and cannot be moved in any certain direction. When absorbing light, Bexley glows slightly and her body temperature rises; when deflecting it, she becomes cooler, darker, and can more easily blend into shadow, but is by no means invisible. She has not quite grasped the concept of holographs and visual illusions, but on accident (mostly when highly emotional) may spark brief replicated images of things around her, including “clones” of herself that sputter in and out of visibility. Bexley’s magic can now harness most other forms of light, though sunlight is still by far the easiest. Her efforts to absorb and deflect light have far more drastic effects, and with concentration, she can give off a glow that floats around her like an aura, strong enough to hurt and disable the eyes when looked at directly. When deflecting, she is much less detectable, blending in like a chameleon to the scenery around her, though her eyes and jewelry may sometimes remain unwittingly visible. Bexley’s illusions are much stronger, but they also drain her quite quickly. While she is able to imitate figures with relative realism, they last for only a minute at most. For the first time, Bexley is able to harness her powers as a weapon by shooting small, sharp sparks of very hot white light toward her opponent. Bexley’s abilities to absorb and deflect light are refined and easy to use, and when deflecting, she can be nearly invisible, a perfect chameleon against her surroundings. Her glow can be blinding if looked at too long. Bexley’s illusions can now take the shape of anyone or anything in her recent memory, not just the figures visible around her, and they last for much longer while still remaining completely solid. Bexley’s sparks of light are much bigger now - each one about the size of a date - and can be directed with more precision over much longer distances. Bexley can glow blindingly or disappear completely at will. Her body temperature is constantly raised and she finds it very easy to deflect and absorb light. Her illusions are corporeal and can last for over ten minutes while still retaining their solidity and realism, though they will never be able to speak. Her tiny suns can grow to any size at will and are relatively easily shot at incredibly high speeds over hundreds of feet. Bexley’s eyes may seemingly glow gold when her magic is being used, in conjunction with a raise in body temperature and a gauzy, glittery shimmer of light across her skin.